Red Ruby is the most valuable gemstone, believed to have the power to make the wearer strong. Unlike other colored stones, Ruby exceeds the value of colorless diamonds in the gemstone world. Ruby is known to increase vitality by affecting blood circulation in the user. This is a stone that focuses on the development and growth of 'self'. This is very much related to the problem of love, remembering its color and strength. It is hot in nature and thus very impactful while overcoming depression, boredom or a type of ignorance. This helps arouse passion, improve vision and also achieve progress in true self-awareness. ruby is believed to make people who wear it respected. President Soekarno reportedly used this type of stone. This stone is suitable for leaders, politicians because it can open the aura so that it increases self-confidence and to raise or maintain positions. Ruby stone is considered as the stone of love, energy, passion, strength, and zest for life. Like no other gemstone in the world besides Ruby which symbolizes perfection for a strong feeling. Other important elements of Ruby Stone besides fire and blood, Ruby Stone is said to be able to restore the vital strength of one's life and can increase energy and strength. Ruby stone is also known as a stone of courage, legend says that someone who has ruby ​​can walk through life without fear of evil or misfortune. Physically, Ruby Stone is thought to provide balance and energy, stimulate the heart chakra and encourage enthusiasm for life, but the goodness is never said by self-destructing ways to overcome fatigue and calm hyperactivity. Ruby can detoxify blood in the body, treat fever, disease, and blockage of blood flow. Thus, Ruby stone is very good for the heart and circulatory system which can stimulate adrenaline, kidneys, reproductive organs and spleen. Emotionally, Ruby Stone is believed to increase motivation and goal setting. The illusion of Ruby stone invites more positive dreams, visualization, help in maintaining wealth with a clear spirit. Ruby stones can change and eliminate negative emotions such as anger. Ruby stones also describe emotionally about dynamic leadership to bring about a more positive and courageous state of having a sharp mind, strengthening awareness and increasing the power of concentration. Ruby makes you stronger when faced with rejection or disputes and can be a shield against physical attacks. A ruby ​​is also said by a disputing settler that can have the power of reconciliation. Ruby is dynamic, and brings enthusiasm and enthusiasm. Effect of Ruby Precious Stones on Health according to Vedic Asrology. In certain circumstances, Ruby is used to increase hemoglobin. Those who are physically weak are advised to use Ruby. Positive effects of Ruby can help reduce stomach problems or stomach disease and tuberculosis. Ruby is also used for health and physical strength. According to Asrology, Ruby Stone can also reduce one's negative thoughts. 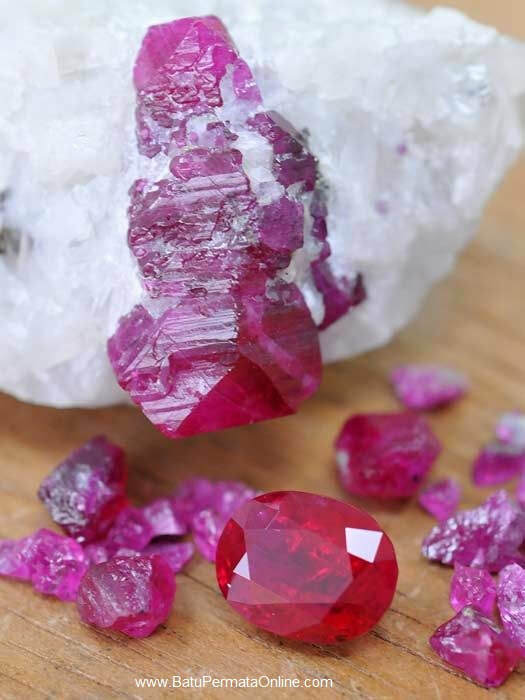 There is a misconception about Ruby that if someone is facing a problem or the stone is not suitable for him, the color of the stone will change. Ruby enhances one's economic status and positive influences also increase people's faith in spirituality.